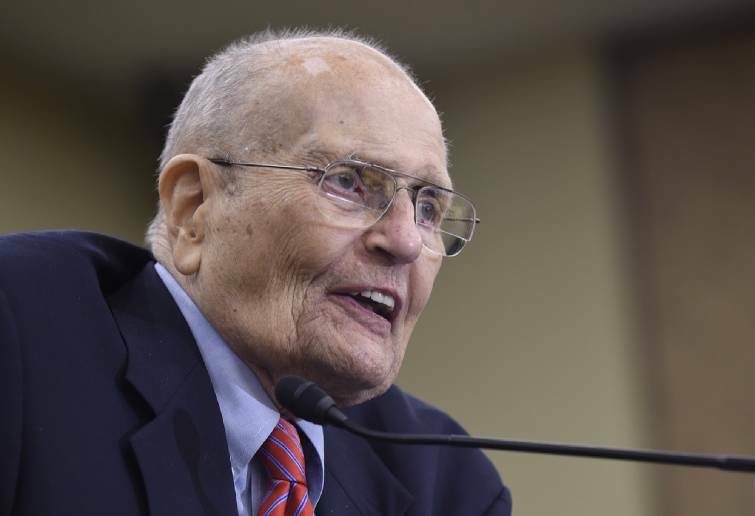 DEARBORN, Mich. (AP) — Hundreds of John Dingell's former constituents lined up Monday at a performing arts center in suburban Detroit to pay their respects to the longest-serving member of Congress in U.S. history, passing his flag-covered coffin and offering thanks and condolences to his family. Dingell's casket was in a ballroom at the center in Dearborn. Outside the room, mourners viewed oversized photos of his life and 59-year career in Congress. He died last week at age 92, four years after retiring from the House. 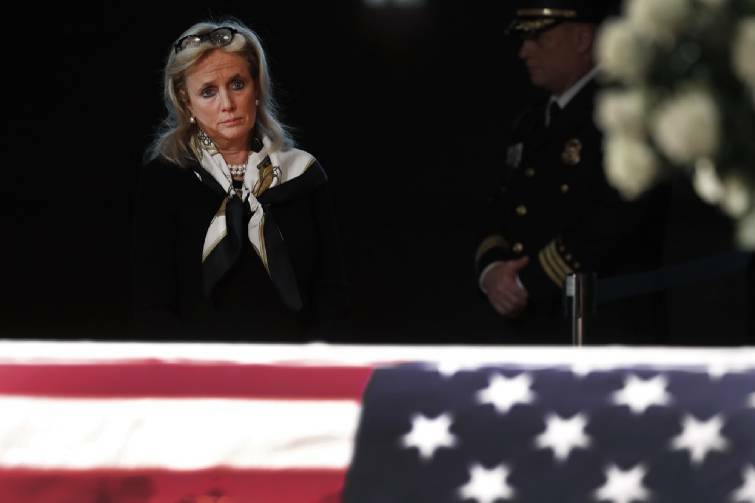 Rep. Debbie Dingell, who was elected to her husband's seat in 2014, stayed to greet everyone throughout the day, after some private moments near the casket with former Rep. Candice Miller and Macomb County Executive Mark Hackel. Imad Hamad recalled how Dingell helped him with a thorny immigration problem that threatened his future in the U.S.
"I think John Dingell is not just an American hero to Americans. I think his model is a global model," Hamad said. "He is one of the few who gave politics a good meaning." The visitation was the first of many public events this week. Funeral Masses will be held Tuesday in Dearborn and Thursday in Washington. A motorcade with Dingell's casket will pass the U.S. Capitol, where the Michigan Democrat held power for years as a House committee chairman. He will be interred at Arlington National Cemetery. Vincent Fregonara, 69-year-old Ford Motor retiree, said he appreciated the late congressman's roots in a working-class section of Dearborn. "He'll be remembered for his service, his dedication, his commitment. And he was for the people," Fregonara said. Dingell succeeded his father in Congress in 1955. Former Vice President Joe Biden, Rep. John Lewis of Georgia and Rep. Fred Upton of Michigan will speak at the Tuesday service. Former President Bill Clinton and former House Speaker John Boehner of Ohio will speak at the Washington service.